Sitting in my wheelchair, on the edge of a trampoline mat, the same thought kept running through my head. I want to jump. Nah. Yeah. I want to jump. With one final I want to jump, my mind took off with exhilarating memories of bouncing on trampolines and flying through the air. Two things I enjoyed as a kid: swimming and jumping. When small, personal trampolines first hit the market, I was right there in line to buy one. For years, I enjoyed bouncing – tiny, little flights of gravity-defying moments. All those memories were buried away deep in the past. Until recently, when I took my grandson to an indoor trampoline park. If you ever have the opportunity, go. The indoor place near me has four separate areas. Each one designed for a different purpose: freestyle, a basketball room, a dodgeball section, and a foam pit area. You can even bounce off the walls! 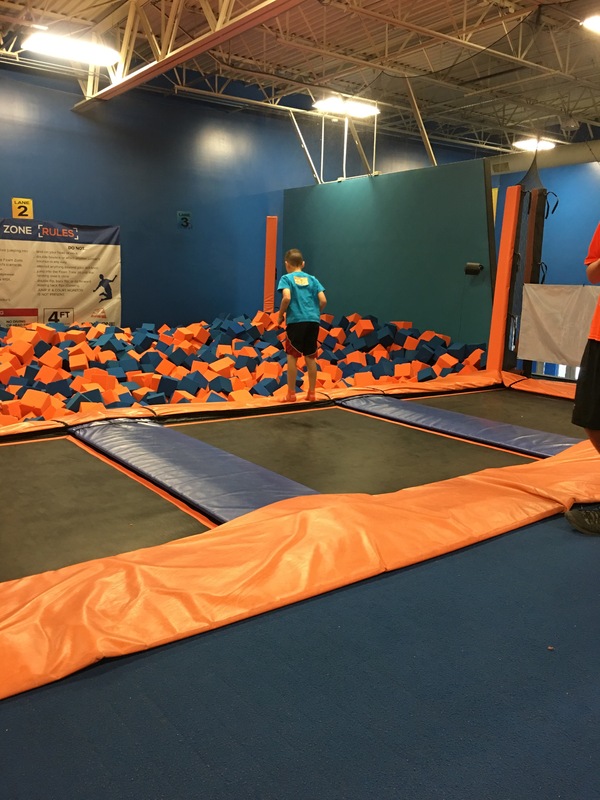 As I sat there watching my grandson bounce, jump, and fly into the air, I felt intoxicated. My body craved to fly. I wanted to bounce, to lift my feet off the floor. I wanted to defy gravity once again. For a serious moment, I contemplated it. For a very long, serious moment. Then reality seeped into the crevices of my gray matter. Do I have the core strength to bounce? How uneven is the supporting edge? Would I be able to get to the mat and back? What if I fall? No, better not try. Maybe? No. I live in a new world, the world known as You Can’t Do That Anymore – But You Can Remember. Some people advise us to forget the past. They say it is best to live in the moment. “The past is too painful,” they preach. While I agree that living Right Here, Right Now is a healthy lifestyle choice, the past should not be forgotten. Memories of how things were before we became disabled don’t have to be pushed away. Our previous experiences add a richness to our lives. Not only are there valuable lessons to be learned, but there are pleasures to be relived. To reminisce and, once more, taste the pleasure of precious moments are treasures to be discovered. Just like the unsolicited recall of an uncomplicated time in my childhood, we can choose to remember with joy – not pain or regret. I may not be able to jump, but I can fly once more. Upon examining the trajectory of my life, I saw that I needed to alter the course. For a long time, I worked hard at being righteous. You know, a good person. Nevertheless, my childhood experiences kept sabotaging me. Suddenly, myotonic dystrophy took over and demanded a change in my behavior. It was at this point that I found my soul – that child who had hidden herself away from the world by the time she was five years old. Knowing that I could die from sudden cardiac death shocked me into reevaluating my legacy. Now, I knew. I wanted to do my best to love and to encourage people. Lofty goals, perhaps, but goals. All this thinking and evaluating my life took a deeper route as I wrote posts for this blog. Since February of this year, I have found co-suffers and co-lovers through the WordPress community. Living with a chronic illness is a road more well-traveled than you might be inclined to think. And, the forms of suffering are as varied as snowdrops. Being bound to adapt to an outside force transforms us. We struggle every day to find a way to be more than conquerors; we must discover a path to be thrivers. So, we share our stories with each other and the world. Hopefully, we bridge the gap. Having said all that, I would like to take a moment to talk about what is going on in the world and society’s reaction to it. The initial shock of hearing about another shooting or, in the most recent incident, a priest having his throat slit, we cry out in unison. Flowers and memorabilia are placed at the location of the atrocity. News reporters provide us with as many horrific details as they can garner. Some of us might talk about the need for change. Others might want to secure our country’s borders against the “illegal alien.” Eventually, we return to our lives. We all suffer – some from chronic illness and disease, some from invisible trouble. Our suffering should be binding us together. Even more, we need to question ourselves. Are we being sensitive to the world around us? Do we put others first? Are we willing to love our enemies? Are we standing up for justice – not revenge? Is peace our goal? Do we have compassion? If we continue to be self-absorbed, then we will continue to see a decline in our society. We have all heard the expression, “If you are not part of the solution, you are part of the problem.” The time to sit on the sidelines and bemoan heinous behavior has passed. All of us need to be thrivers. We need to grow in maturity and character. Format StatusPosted on July 27, 2016 Categories Life, UncategorizedTags #art, #ChronicBlogs, #chronicillness, #disability, Life12 Comments on Words. Wound.